A Soldier writes: Soldiering After the Vietnam War! A Great Story About a Professional Soldier! This is a must read book about a soldier and soldiering! I read Glyn Haynie’s first book, When I Turned Nineteen: A Vietnam War Memoir some time ago. I enjoyed reading this second book immensely. For American soldiers returning home from the Vietnam War, there were no “Welcome Home” signs, no flowers, and no ticker-tape parades. For these soldiers, there were protesters! They were spit on, there was name calling, there was disrespect, and yes, there was even hatred. The Vietnam War was an unpopular war, but these young men did not ask to go to war. They only did what their government sent them to do. Honest and Forthright Story Telling! 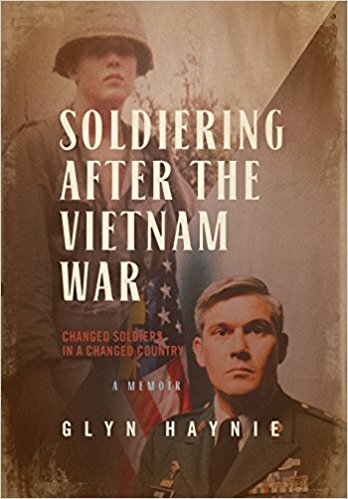 With unflinching honesty, author Glyn Haynie’s new memoir, Soldiering After the Vietnam War: Changed Soldiers in a Changed Country, describes the difficulty he and many soldiers faced in adjusting to civilian life on their return from Vietnam. This moving story chronicles the impact this war had on these young combat veterans. It exposes how the shameful treatment these soldiers received on their return from Vietnam impacted them. However, it is also a story of brotherhood and the strong, lasting bonds that can only be forged in combat, bonds that were so often very important in the healing process many Vietnam veterans had to work through. Lastly, it is a celebration of the courage, dedication, and perseverance so many American veterans possess. Haynie shares with his listeners his struggles and his successes, completing a stellar 20-year career in the US Army, culminating as an instructor at the US Army Sergeants Major Academy. His story is one that clearly demonstrates just how wrong those protesters were…and just how much our country does owe these men and women who served their country with bravery and honor…our gratitude and respect. Glyn Haynie’s story will touch you in many ways…stirring feelings of embarrassment, anger, understanding, gratitude, and pride. It is a story all Americans should hear. I do think this is a book that will appeal to certain audiences. Some readers may find it difficult to understand some of the military jargon, etc. But, that is also what makes this book so great if you have a “military mind”. Is compensation low for veterans of the Vietnam War? Retired at a high class is guaranteed, but soldiers with low class is little compensation after retirement,really? They had their benefits depending on length of service, etc, but because it was an unpopular war, many soldiers were treated badly by some Americans when they returned home from Vietnam. It is the veterans of the Vietnam War! I am interested in photographer Mr.Jerry Tovo. His pics are impactful and powerful. It is President Kennedy who accelerated? It is Not the Responsibility of the Soldiers on site have the toughest job…I think. For whatever country, it is always the veterans that shoulder the responsibility of a war that they often did not choose to fight, but simply answered their country’s call. They should always be treated with respect. I will have to check out Mr. Jerry Tovo’s photos. Thanks Nasuko. Excellent review. The one thing we are doing much better on, is how we treat our returning heroes. Glad we learned something important from Vietnam. Yes. We have certainly gotten much better. I hope we do not lose that again. Thank you for your comment!